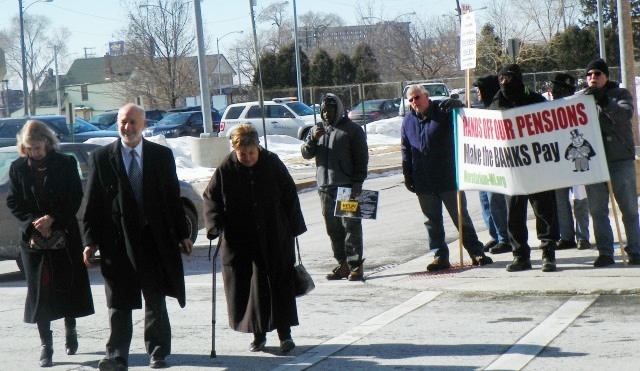 Detroit retirees protest Orr, Rhodes, Rosen in freezing temperatures outside Crain’s luncheon Feb. 26, 2015. Poster of Aiyana Jones, 7 when killed by Detroit police in 2010, was prominently displayed. It’s not one thing–it’s everything. DAREA VP Cecily McClellan at right. DETROIT – As 32,000 members of Detroit’s city retirement systems lose huge chunks of their pension checks and annuity savings funds (ASF) accounts this week, on top of health care elimination, wage cuts, and lay-offs already in place, Wall Street is celebrating its $2 billion coup in the Detroit bankruptcy. The Detroit Financial Review Commission (DFRC) published figures Feb. 16 that show the city’s total general fund long-term debt (LTD) from 2015-44 is now $3,008,162,089. According to the city’s last available Comprehensive Annual Financial Report (CAFR) of 2013, the general fund LTD then was $1,003,937,000. 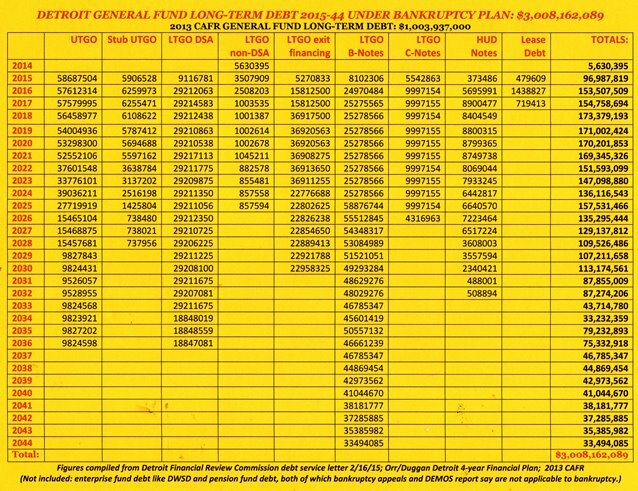 Click on City bond debt under bankruptcy for copy of chart; click on DFRC report for full copy of Financial Review Commission report. Darrell Burks former senior partner at PricewaterhouseCoopers, Stacy Fox, former deputy EM under Kevyn Orr, Dupont Senior VP, Roxbury Real Estate, Lorron James ,VP of James Group Int’l, military contractor with Lockheed Martin; Bill Martin, founder of First Martin Corp., a real estate, construction, and development firm; Tony Saunders, former director at Conway McKenzie law firm, prime player in Detroit bankruptcy. Every decision on every dollar in Detroit goes through these nine men and women. Detroit workers, retirees and residents are liable for the debt, to be paid BEFORE any spending on city services. Under terms of the bankruptcy plan, the DFRC is the final decision-maker on city finances. “The City pledges to pay the principal of and interest on the Bonds as a first budget obligation from its general funds and in case of insufficiency thereof, from the proceeds of an annual levy of ad valorem taxes on all taxable property of the City, subject to applicable constitutional, statutory and charter tax rate limitations,” says the bankruptcy exit plan. The DFRC report says the city’s state revenue-sharing payments, already slashed by $7.32 billion over the last 10 years, will also back up portions of the debt. Ratings agency Standard & Poor’s celebrated the inclusion of state aid liens, giving four of the bond deals investment-grade ratings in the A range. “Factors that strengthen the new credit and offset some of the weaker characteristics cited include the statutory lien on state aid, a first lien on debt millage from the city’s UTGO pledge, and the direct flow of state aid needed for debt payments from the state treasurer to the trustee as well as the direct flow of debt millage directly to the escrow trustee,” the Bond Buyer reported Dec. 22, 2014. In other words, the state pays the debts directly to Wall Street without local government intervention. 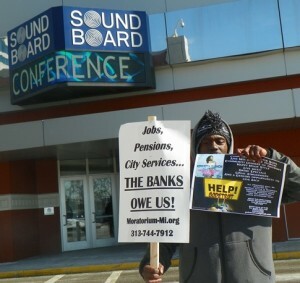 Protester at entrance to MCC Sound Board. 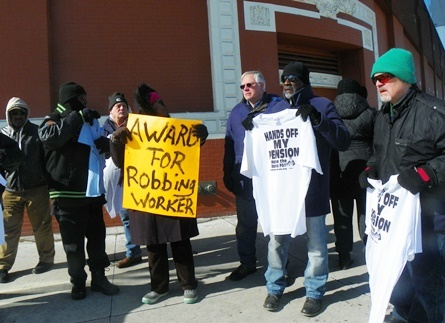 “Thieves!” and “Al Capones!” a furious group of retirees shouted at well-heeled patrons arriving at a Feb. 27 Crain’s Detroit “Newsmakers” luncheon. The event honored former Detroit Emergency Manager Kevyn Orr, U.S. Bankruptcy Judge Steven Rhodes, and bankruptcy mediator U.S. District Court Chief Judge Gerald Rosen. 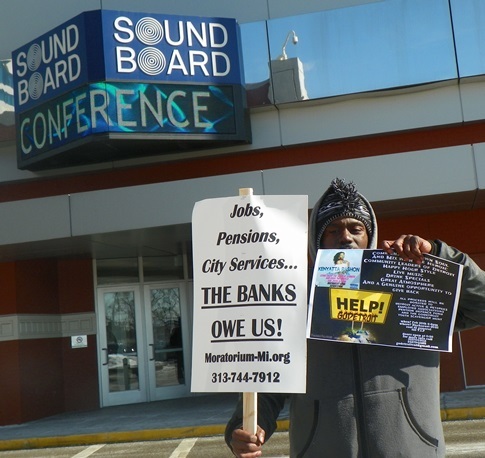 “The banks got bailed out, we got sold out!” and “Don’t honor thieves!” retirees chanted as the predominantly white attendees, including former EM Kevyn Orr and Jones Day attorney Heather Lennox, exited expensive cars, limousines and buses outside the entrance to the Motor City Casino’s Sound Board in downtown Detroit. Protesters added a chant of “Newsmakers make up the news!” referring to what they said was biased coverage in favor of the bankruptcy by most of the mainstream media. During the luncheon, Orr and Rhodes congratulated the media for their coverage. The fact that the two spoke together with Rosen shed more doubt on the judges’ impartiality in the bankruptcy case. Retirees confront luncheon attendees, who paid $70 a head, charging robbery. 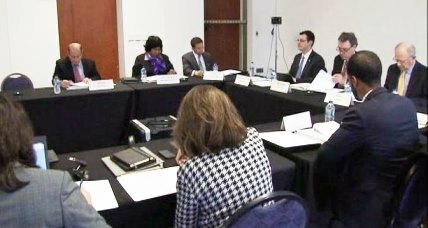 VOD has already exposed Rhodes for chairing a one-sided forum Oct. 10, 2012 on Chapter 9 bankruptcy and Emergency Managers, which featured a chief witness for the “city” at the bankruptcy trial, Charles Moore of Conway Mackenzie. Also speaking were a co-author of Public Act 4, the predecessor to PA 436, EM trainers, and other pro-EM and Chapter 9 advocates. 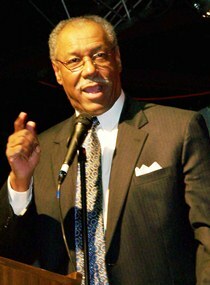 “That constitutes not only an ethical violation, but Rhodes’ confirmation of the bankruptcy despite his knowledge of criminal fraud as exposed in the city’s lawsuit against the $1.5 billion ‘Certificates of Participation’ loan makes him liable for criminal charges as well,” retiree Cornell Squires of We the People for the People said. 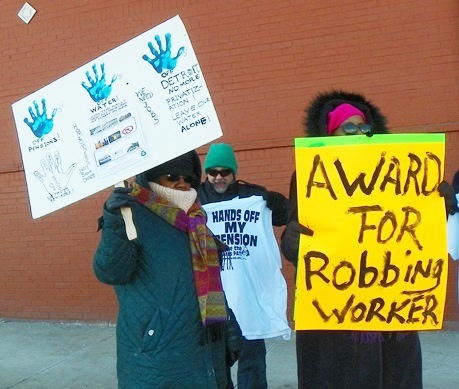 “It is important that we are here today to show the world that we are still fighting, that the so-called ‘Grand Bargain’ was nothing but a ‘grand theft,’” Cecily McClellan, vice-president of the Detroit Active and Retired Employees Association (DAREA), told the crowd. Jones Day atty. Heather Lennox arrives; she has been assigned to handle bankruptcy appeals. The mainstream media has completely ignored ongoing appeals in front of U.S. District Court Judge Bernard Friedman, filed by DAREA, the Ochadleus Group/Quinn, Jamie Fields, and others. The city summarily moved to dismiss the appeals without filing responses to them on Feb. 21, as did the so-called Detroit Retired City Employees Association (DRCEA), headed by Shirley Lightsey. The DRCEA even requested $50 legal donations from its members to cover their expenses in the case against city retirees. But Friedman has not set a date for a hearing on the dismissal motions. Instead, he has told the city to provide “responsive briefs” after the appellants provide their responses to the motions to dismiss. Copies of the pertinent motions are attached below. 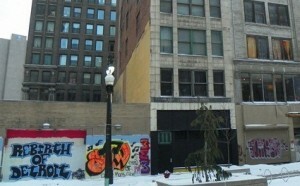 “Rebirth of Detroit:” Dan Gilbert affiliates moved tenants out of bldg. next door and long-time Black and disabled residents from Griswold Apartments across street in Capitol Park. The media generally claims retirees are losing only 4.5 percent of their pensions, ignoring huge six-figure sums being ripped from many annuity savings accounts, as well as new monthly payments of as much as $1200 for retiree health care. It has celebrated the bankruptcy as “the rebirth of Detroit,” refusing to acknowledge that it may be nothing but a house of cards if Detroit is not able to repay the $3 billion debt Wall Street has foisted on it. Detroit retiree protests on Grand River before moving to MCC Sound Board entrance. MMA cited the bankruptcy plan’s giveaway of many of the city’s major revenue-producing assets, which include most of the Detroit Water and Sewerage Department, the Joe Louis Arena and other riverfront and downtown land and revenues. The state of Michigan imposes a legal debt limit on its municipalities, which is 10 percent of the total assessed value of all the entities’ real and personal property. According to Detroit’s 2013 CAFR, the city’s total debt limit was $1,558,064,000, with total net debt applicable to the limit at $1,039,011,000.The $3 billion total LTD already exceeds the limit, while figures from the DFRC report show the city’s annual debt payments rising year by year, with no substantial increase in revenue. Detroit “Mayor” Mike Duggan reported in his State of the City Address that income from property taxes is expected to decline at least through 2017. Wayne County’s chargebacks to the city for foreclosed property it bought from Detroit, but cannot sell at auctions, are a huge factor, amounting to $82 million last year. Duggan also cited declining property values and likely increased foreclosure activity. 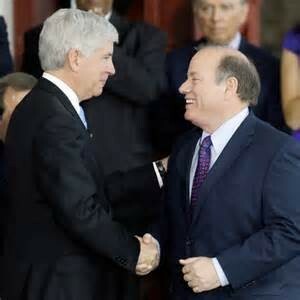 He did NOT cite the huge tax breaks being accorded to wealthy developers like Dan Gilbert and Mike Illitch. BELOW: VIDEO OF KEVYN ORR AND JUDGE STEVEN RHODES AT CRAIN’S LUNCHEON. SPEAKERS, ATTENDEES HAD MANY GOOD LAUGHS AS DETROIT RETIREES SUFFERED WORST ATTACKS IN U.S. PETITION: Sign the petition to halt changes to pensions and other benefits, to U.S. Justice Department, at http://petitions.moveon.org/sign/selective-enforcement?source=s.icn.em.mt&r_by=9645222. 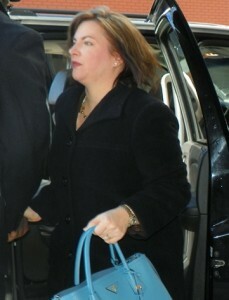 FUNDRAISING: To donate to DAREA’s LEGAL DEFENSE FUND, click on http://www.gofundme.com/pensiondefensefund. Or checks can be made payable to the Detroit Active and Retired Employees Association (DAREA), at P.O. Box 3724, Highland Park, Michigan 48203. 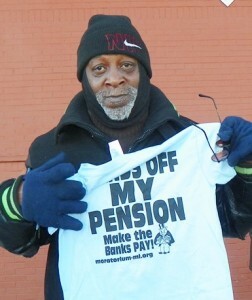 “Hands off my Pension” T-shirts shown in photos above are available for $10 each. The fundraising committee will continue to sponsor events to cover what is anticipated will be substantial legal fees. WEEKLY MEETINGS: To receive notices of meetings, updates on the appeal and events information please provide your email address and phone numbers via email at Detroit2700plus@gmail.com or call DAREA at 313-649-7018. Read DAREA’s position statement at DAREA Call/. Retirees pack DAREA meeting Jan. 21, 2015. This was the most horrific assault on a group of people in recent history. My heart goes out to all the retirees who had the rug jerked from under them for no other reason but to raid a fund that contained billions of dollars. The fund could have been converted to a 401k plan, attritioning the retirees; however, they chose to disenfranchise thousands of people who sacrificed up front (lower pay) to be comfortable in their golden years. I pray everyone involved in this coup get exactly what they deserve, which would be hell fire.